Warde's Ji Young-Anderson will be the Mustangs' captain in 2011-12. 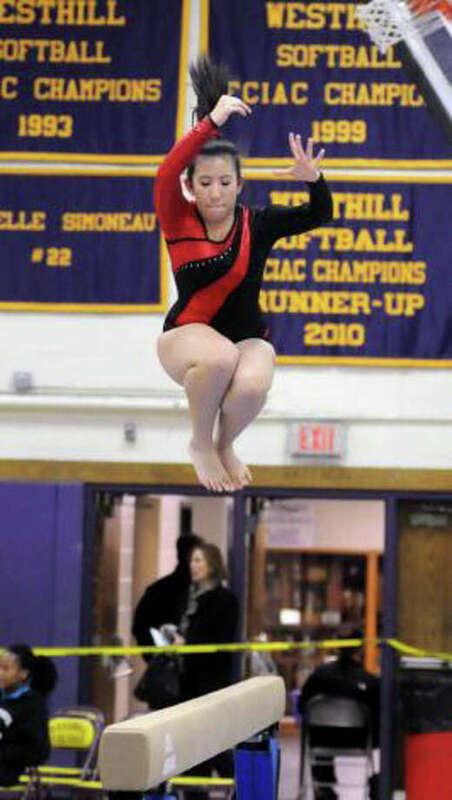 The Fairfield Warde gymnastics team is confident that it will continue its progress. According to its captains and head coach, Warde believes that its strong returnees, coupled with two high-level freshman, will improve on last year's 4-9 regular-season record and fifth-place finish at FCIACs. Although the Mustangs qualified for the Class M meet, they didn't compete at states because they missed most of their squad, who were out of town for February vacation, during the state championship weekend. Not only does Warde plan on qualifying again, but according to its captains, it plans on competing and improve on its eighth-place finish in February, 2010. The Mustangs will miss Ali Kirsch, Emily Zeisler and Megan Kelly, who graduated from last year's team, but welcome back nine girls who continue to improve. Senior captain Ji-Young Anderson and junior captain Sarah Zeisler lead the team and are expected to contribute on floor exercise and the balance beam. Juniors Sarah King, Molly Wilkinson, Judy Thurston and Stephanie Kovis along with sophomores Tori Gallati, Judith Kling and Kierston Lazar return from last year. Gallati is expected to be an all-around again and Kling has the potential of being an all-arounder. Freshmen Sophomore Mancini and Kathleen Pisciotta will be all-arounders and could be Warde's top performers. "I think it's going to be a great year," Mustangs coach Darcy Appleby said. "I hope we'll finish fourth or fifth at FCIACs, third would be nice. I think we have the talent on the team." Former Trumbull coach Judy Zakim will be Appleby's assistant and the longtime head coach is happy to have Zakim on board. In order for Warde to have a successful season, it needs to stay healthy and increase the difficulty of its routines, according to Appleby. Overall, the Mustangs are optimistic and they would especially be happy if they outscore Fairfield Ludlowe this year. "We've gotten closer [to obtaining success] through the years," Young-Anderson said. "We'd like to improve on our standings at FCIACs and states. This year, we're definitely going to states. We'd like to beat Ludlowe. I'm really excited about the new freshmen. They are awesome. We're already a better-rounded team than we were last year."